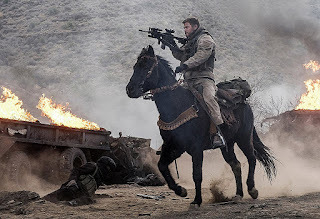 Thor gets promoted to Captain America in 12 Strong, in which Chris Hemsworth plays Green Beret Captain Mitch Nelson, inspired by real-life Green Beret Captain Mark Nutsch, who led a twelve-soldier U.S. Special Forces team in Afghanistan during the months following 9/11. Their daunting, three-week mission is to link up with local warlord Abdul Rashid Dostum (Navid Negahban), one of several tempestuous leaders of the Northern Alliance, and fight their way to retake the Taliban stronghold of Mazar-i-Sharif. This is a true story about laudable gallantry, yet a film built around a novelty—the fact that members of Nutsch/Nelson’s ODA 595 unit rode horses alongside their Afghan counterparts to traverse the treacherous terrain. The rest of the time it’s all camo and camaraderie colliding with a hail of bullets, bombs, and bombast. Ted Tally and Peter Craig’s script is full of gung-ho platitudes and agitprop—yes, the Taliban’s treatment of women is horrific, but a scene in which the baddie de jour executes a mother for teaching her children how to read it utterly untethered from the rest of the narrative. The real monotony is saved for the action sequences, ostensibly the film’s hallmark. When they’re not galloping into battle, Nelson and Dostum size up each other’s killer eyes under the cover of American aerial armaments. Director Nicolai Fuglsig spends a lot of time with the heart-pattering particulars of how to map bombing coordinates, then revels in the shock and awe of explosives delivered by unseen B-52s. When the firefights do occur, they’re fraught with confusion, shot from disjointed perspectives and backdrops. Moreover, Fuglsig adopts the Lone Survivor school of modern military filmmaking, where it takes a dozen bullets to take down a single American soldier yet the endless reservoir of faceless cannon fodder are dispatched with single head shots. The film is constructed like a video game, with avatars instead of characters and each village serving as a new level. The only things lending 12 Strong any verisimilitude are its “Based on a true story” prologue and its end card reciting the legacy of Mazar-i-Sharif’s liberation and what happened to its liberators. Earnestness abounds, but this war-meets-cowboy-meets-superhero movie from producer Jerry Bruckheimer doesn’t rise above its mise-en-scène.